When Will I Get My Appointment Cards? 5,000 and under Appointment Cards: Ships or ready for pick up in 2 business days from proof approval. Over 5,000 Appointment Cards: Ships or ready for pick up in 5 business days from proof approval. Keep on schedule with our custom appointment cards! Ordering appointment card printing with 48HourPrint.com gives you peace of mind that you are receiving high quality printing at very affordable prices. Our custom appointment cards deliver more for your money and the convenience of online ordering. Appointment Cards are a perfect inexpensive reminder tool for marketing your business. In this busy world, scheduled appointments can get easily overlooked without a reminder. Use them to communicate with your patients or customers in a number of ways. Appointment cards serve as a reminder of their scheduled appointment date and quickly provide the contact information they need if they have questions or need to reschedule. Your patients or customers will appreciate this takeaway they can reference at anytime. Appointment cards are perfect for financial and insurance professionals, salons and spas, as well as doctors, dental professionals, chiropractors, therapists, pet care professionals, and others. Preserving the environment is important to 48HourPrint.com. 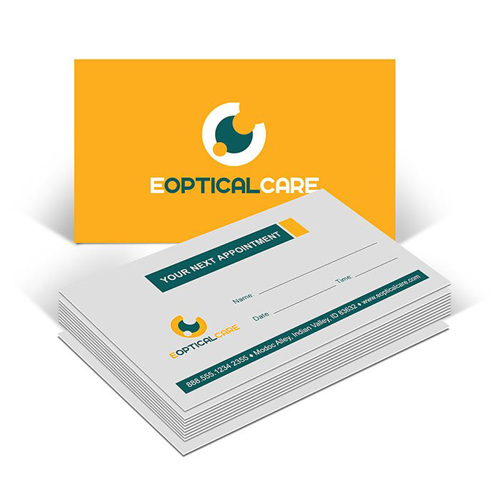 Our appointment cards - including two-sided appointment cards - are printed on recycled paper. Recycled paper is our standard stock, at no extra cost to you. This gives you great appointment card printing results on paper that is brighter and more uniform in color. All of our appointment card printing is full color on both sides and printed on 100# opaque smooth uncoated cover stock.